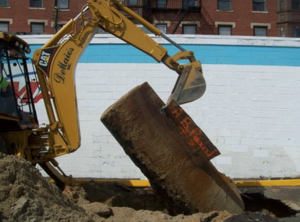 Above ground storage tanks (ASTs) have become a very popular option for many schools and businesses due to the complex regulations affecting underground tanks. ASTs are used for a variety of purposes but most notably for fuel for vehicles, boilers, and emergency generators. The University currently has over 60 above ground tanks registered with ADEM. Sizes range from 50-2500 gallons. Above ground tanks do not have all the regulations associated with underground tanks. However, there are a number of requirements affecting them. In 1995, the EPA developed and implemented a program to address above ground storage tanks. The major concern, as with USTs, was to prevent hazardous materials from entering the environment and in particular the groundwater. As with other programs, the EPA relies upon the state to administer the AST program. The Alabama Department of Environmental Management is charged with this responsibility. EHS works with ADEM to make sure above ground tanks located on campus are in compliance with regulations. Is there any visible damage to the tank? Is there any evidence of drips or overspills? Does the tank have secondary containment? Does nearby vegetation show any evidence of soil contamination? All ASTs, whether mobile or stationary, are inspected by EHS and registered with ADEM. 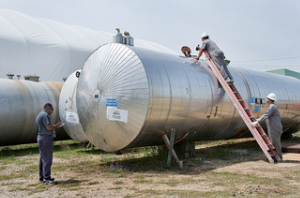 Underground storage tanks (USTs) are tanks that have at least 10% of its volume underground. At one time there were a number of USTs located at various sites on campus. Most of these have been removed from service. At present, The University still has a few all of which are associated with fueling operations. Following World War II the demand for automobiles and therefore gasoline increased dramatically. These increases lead to a proliferation of gas stations and automobile servicing throughout the country. With this came USTs. In addition, many companies and businesses opted for the cleaner non-industrial appearance of underground tanks. As a result, thousands of USTs were installed. Most of these were made of bare steel with no corrosion protection. The average life expectancy of these tanks was about 30 years. Corrosion of steel tanks usually causes them to leak slowly rather than a sudden failure. Leaks were often difficult to detect because of imprecise inventory control. Once released from the UST gasoline floats on the surface of the water table. Due to the volatile nature of gasoline, leaks would often go undetected until vapors were found at the surface level of the ground. Nearly half of all Americans depend on groundwater for drinking water. Leaking USTs began to present a significant public health threat. IN 1985, the EPA created a department to develop and implement a regulatory program for UST systems. The EPA published UST standards in 1988. Tank owners were given ten years to upgrade or replace old tanks. Since then over 1.5 million USTs have been removed from service. Most UST programs are implemented by state agencies. In Alabama this is the Alabama Department of Environmental Managed (ADEM). They provide inspection services and manage the state UST program. Spill protection in the form of a catchment basin. This should contain what may spill when the delivery hose is uncoupled from the fill pipe. Overfill protection which will shut off product flow, restrict flow or alert the operator when the UST is close to being full. Registration and payment of fees to ADEM for UST systems. EHS manages the UST program for the University of Alabama. This includes registration of tanks, development of training programs and written response plans, liaison with ADEM and determining the application of regulations to UA.